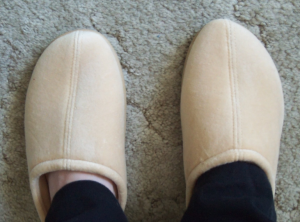 I was so excited to learn that I would be reviewing the Nature’s Sleep Closed Toe Terry Slippers w/Memory Foam! I got my slippers in a size Large. I wear a size 10 shoe… I know, I have gigantic feet! They fit my feet perfectly… like a glove! I hate when you buy slippers and they fall off easily while you are walking. I’m already clumbsy! These slip on and off very easy, but stay on great while I am walking. I am so pleased with the sizing. They are available in size small, medium, large, and x-large. They also come in a variety of colors. When I placed my feet in them I could not believe how comfortable they were with their softness and support. They have a visco-elastic memory foam inner sole. I took my fingers and pressed on the inner sole and could easily see how it contours to your feet. So comfortable! They also have a thermoplastic rubber bottom, so I even wear them outside. I’ve worn them out to the barn and down the drive this morning to set out the trash. The gravel didn’t even seem to bother my feet! I have the roughest feet. I’m not sure why. I’ve tried every kind of lotion made, so I’m glad I can wear these everywhere in and out of the house to keep my feet in cool comfort all day. I am constantly up and down all day long, so I love that these provide pressure relief and the comfort my feet need all day long. What’s the verdict? The Nature’s Sleep Memory Foam Slippers get an A+ from the Giveaway Bandit! 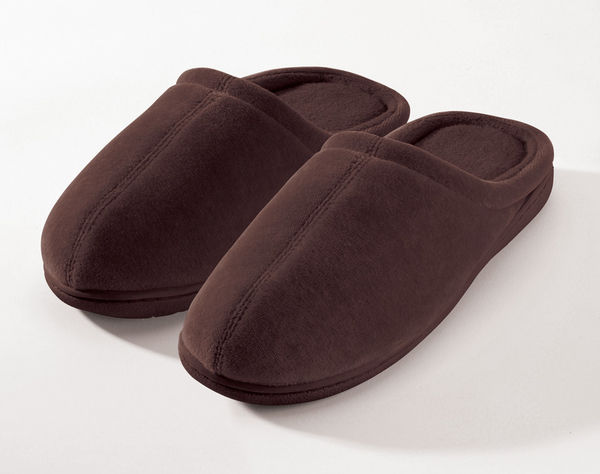 If you want extra comfort and relief for your feet, you need to get a pair today! Ready to enter to win a pair of your very own? Enter to win below via the giveaway form. Giveaway ends July 6, 2012 at 11:59 pm EST. US residents only, 18 years of age and older. Good luck! Giveaway Bandit received one or more of the products mentioned above for free for evaluation purposes and is an affilate of one or more of the products and banners you will see on this site. Regardless, all opinions expressed are still 100% my own. I am disclosing this in accordance with the Federal Trade Commissions 10 CFR, 255 Guides Concerning the Use of Endorsements and Testimonials In Advertising. Giveaway Bandit Disclosure. « DEAL OF THE DAY: Dyson DC27 Reconditioned Vacuum 52% off! would love to have the memory foam pillows because I have neck problems. I’d love to have any king sized memory foam mattress on their website and also their dog bed for my poochie! Thanks for the giveaway. i liked the Pet Bed w/Memory Foam. I would love to have the memory foam topper! I would love to have the Faux Down Pillow. anti-microbal, anti-dust mite, anti-bacterial and allergen resistant and are ideal for those who suffer from allergies. That their products is get for those with allergy’s. Personally I Liked the V Pillow a more tradition shape. If I had the money I would consider this highly. They have 20 year limited warranties for certain mattresses. I would love to have Pet Bed w/Memory Foam. My little Juliet is getting older and has trouble walking.I think the pet bed would help her. I would love the mattress topper. i learened that they even have pet beds,awesome!!! I like the 8” St. Bart’s Mattress because it is firm and my sheets will still fit. I would love to own the 11” St. Thomas Mattress. I love the pillows available and my favorite pillow is the Visco Memory Contour Pillow! Looks so comforable! I love the foam memory topper. They make eco friendly sheets…which is fantastic. I would love to have the memory foam mattress or pillow. the biocrystal items sound intriguing! I was unaware that they sell pet beds. I like the Pet Bed with memory foam! I would love the Memory Foam Topper – Thanks! I would like to have the memory foam dog bed. I like the Memory Foam Topper.